Kate Somerville has an enviable career – a successful skincare clinic in Los Angeles with numerous celebrity clients, a personal skincare line, and numerous media appearance (both television and print). I had certainly heard of her when I found out that she had just published a book: Complexion Perfection! Your Ultimate Guide to Beautiful Skin by Hollywood’s Leading Skin Health Expert. I looked the book over at Barnes and Noble and then decided to buy it. One of the reason I wanted to buy the book were the full-page, color before and after photos she had for the makeover section of the book. It is very, very hard to find a book about skincare with such quality, color photos. I saw the photos, and I was hooked. Additionally, as an esthetician I was very pleased to see that a fellow esthetician wrote a book about skincare instead of a dermatologist. Kate Somerville begins her book with a very revealing autobiography section which chronicles both her personal and skincare struggles. Needless to say, Somerville is certainly a self-made woman, and after reading about her tough childhood and young adult life (after her parents divorced when she was nine years old her mother descended into drug addiction eventually ending up homeless. Her father remarried to a woman who already had her own children and eventually Somerville moved in with a friend in order to find stability) I truly admire her for overcoming great odds in order to be the success that she is today. In addition, Somerville has suffered from severe eczema almost her entire life so she really does understand both the physical and psychological manifestations that skincare problems can have on one’s emotional wellbeing. It was writing like this that made me like this book. What I Liked About Complexion Perfection! So first and foremost, as I already stated above, I really like and agree with Somerville’s outlook on skincare. I liked hearing about how she treats and cares for her personal clients. Somerville has a great upbeat attitude that I thought was refreshing. The information about skincare in the book is good – good but basic. I didn’t learn anything new, but then, of course, I guess that is good since I’m an esthetician. For non-skincare professionals looking to have a guide at home as to how to care for their skin this book will do the job. I liked the fact that she had clear and concise instructions listed for all sorts of skin types and conditions. For this reason you can simply use this book as a reference book if you want to know how to treat a particular skin condition (like acne, hyperpigmentation, or eczema). There is information on common skincare ingredients and a clear explanation of how to care for your skin at home (including instructions for doing a home facial). Chapter 6 of the book is entitled “Treatments That Transform” and gives very good information about a whole slew of facial treatment options from the basics like facials, to an explanation on four different kind of lasers, and explains the differences between injectables. She even includes the estimated costs of different treatments which I think is great since it helps people understand how much they would be spending approximately if they wanted to try certain treatments. 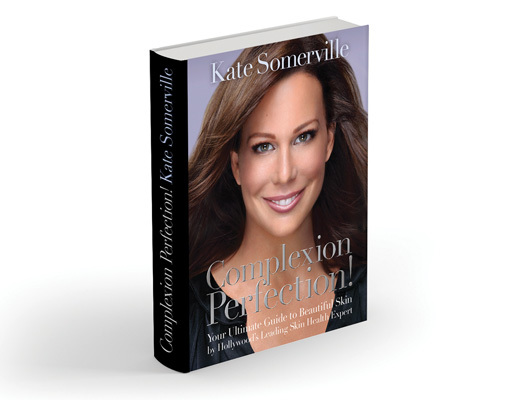 I also liked the fact that though Somerville has her own line of skincare products she doesn’t give them a hard sell in her book (which, in my opinion, is in direct contrast to what Paula Begoun does on her website and in her own books). There is an explanation at the very back of the book on each product in Kate Somerville’s skincare line, and my book even came with a coupon for 10% off and free shipping on products ordered through her website. Of course once I saw how much her products cost even with the discounts I decided to wait before trying any. My Disappointments with Complexion Perfection! The book includes a chapter all about diet and your skin. I was happy that Somerville did not try to pass herself off as a nutritionist or medical dietary professional but instead included personal accounts of how diet effects skin and also advice of a doctor when it comes to food and its effects on the skin. I don’t know how I feel about her passing out advice about supplements (she also sells supplements that claim to help certain skincare conditions) even if she did write the information in the chapter with the help of a doctor. I never give my clients advise about diet since I am not a medical doctor or a nutritionist even though I do think there is a connection between the health of the skin and one’s diet. For that reason part of this chapter made me feel uneasy. I would definitely consult with a doctor or a nutritionist before taking any supplements to improve the appearance of your skin. Somerville also sees a direct connection between the consumption of dairy and breakouts. I am not so sure that things are so black and white when it comes to this issue. Much more research needs to be done about the connection between acne and food before there can be definitive information on the subject. But my main disappointment with this book comes from the makeover section which was the one section of book that I was most looking forward to reading. Yes, the photos are glorious and add a great deal to the explanations provided so I guess I got my money’s worth there. My problem was with the actual treatments the makeover volunteers received. On average each volunteer received about four laser or light treatments and many received around four injectables as well (Botox, Restylane, Radiesse, and Juvederm)! Anyone who received that many intense, expensive, and strong treatments would see the results that were presented in the book! I longed for a makeover that did not include any of these treatments (or many fewer of them) and instead presented results that could be achieved by anyone even those without access to such sophisticated treatments and certainly for those without the means to invest in such treatments. Yes, the home care regimes of each makeover volunteers are explained, but believe me – the dramatic makeover results had nothing to do with the volunteer’s new home care regime. The results had everything to do with the power of lasers and injectables; the home care regimes are important for maintenance reasons alone. It was upsetting for me to realize that though Somerville believes everyone deserves to have beautiful skin and feel great about their skin she is suggesting treatments that few people can afford. Yes, Somerville is a medical esthetician (or a paramedical esthetician as she calls herself), but I wish she had at least for one person presented in the makeover section who didn’t have one laser treatment or injectable. Complexion Perfection! is a good, basic reference book about skincare to have at home. If you are interested and can afford laser and light treatments this book is a great guide to what results you can expect from such treatments. Certainly Somerville’s life story and career success will help others realize that anything is possible, and her positive philosophy about skincare will inspire many more. I really appreciate your review of this book. I live in Sweden and if I want to buy this book I have to get it shipped overseas from Amazon.com. I am a skin therapist with 30 years of knowledge and I thought I could get some new information from this book. I realize after reading this that I won´t! I should have learned by now that the grass is not always greener on the other side.